Stephen Kelson is an experienced AV rated litigator and shareholder of the Salt Lake City law firm of Christensen & Jensen. He has been mediating civil litigation cases since 2000, and has mediated over 500 cases. 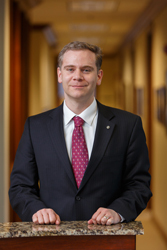 His professional experience involves civil litigation counsel for both plaintiffs and defendants. He is dedicated to assisting parties to resolve their disputes in a way that is effective, efficient, and economical.Stephen received a Masters in Dispute Resolution from the Straus Institute at the Pepperdine School of Law, and has over 800 hours of alternative dispute resolution training. He presently serves as the Chair of the Utah Council on Conflict Resolution (UCCR) and has formerly served as the Chair of the Dispute Resolution Section of the Utah Bar Association. He has also been a Court-Qualified Mediator on the Utah Court Roster of Mediators since 2002, and Master Mediator. Stephen regularly lectures and publishes on topics of dispute resolution, professional responsibilities, and the practice of law. He is listed as one of Utah’s Legal Elite in Civil Litigation, the recipient of the 2011 Utah Service to the Courts Award from the Utah Judicial Council, and Utah Dispute Resolution’s Mediator of the Year (2005). He also provides service to the legal community as a pro tempore small claims judge, a volunteer mediator for Utah Dispute Resolution (UDR), and through membership on the Utah Judicial Council Alternative Dispute Resolution Committee and American Bar Association (Litigation Section) ADR Committee. Education: B.A. University of Utah, 1995; M.A. University of Utah, 1997; J.D. J. Reuben Clark Law School, 1999; M.D.R. Pepperdine School of Law, Straus Institute for Dispute Resolution, 2013. Clash of Cultures: How We Manage Personal Conflicts and Why, Utah Chapter of the National Federation of Filipino American Association (NaFFAA), Salt Lake City, Utah, April 18, 2015. Dirty Litigation Tactics: How to Deal with the “Rambo” Litigator: Identifying the “Rambo” Litigator, National Business Institute (NBI), Salt Lake City, Utah, April 15, 2015. Effectively Representing Clients in Mediation with Civility and Professionalism, panel moderator, ADR Academy, Utah State Bar Dispute Resolution Section, Salt Lake City, Utah, October 10, 2014. What Goes on Behind Closed Doors in Mediation (co-presented with Karin Hobbs, Lincoln Hobbs, Ed Havas, Nathan Alder, and Heather Thuet), Utah State Bar Summer Convention, Snowmass, Colorado, July 17, 2014. Civility in Negotiation and Mediation (co-presented with Joshua King), Utah State Bar Dispute Resolution Section and UCCR’s Annual Ethics Seminar, Salt Lake City, Utah, June 18, 2014. Tools to Success in Mediation, Solo, Small Firm, and Rural Practice Section of the Utah State Bar, Salt Lake City, Utah, March 21, 2014. Apology: Expectations and Effects on Outcomes, Kiwanis Club of Salt Lake City, Utah, April 17, 2014. Crossing Ethical Lines: When Paralegals go too Far, Utah Paralegal Association, Salt Lake City, Utah, October 18, 2013. Common Mistakes made by Attorneys in Negotiation, panel moderator, ADR Academy, Utah State Bar Dispute Resolution Section, Salt Lake City, Utah, October 4, 2013. Persuasion in Mediation, Utah State Bar Dispute Resolution Section and UCCR, Salt Lake City, Utah, August 28, 2013. Dirty Litigation Tactics: How to Deal with the “Rambo” Litigator: Defeat the Unethical Practices of Opposing Counsel!, National Business Institute (NBI), Salt Lake City, Utah, May 23, 2013. Communication Skills for Client Interactions, Pioneer Cable Contractors, Sandy, Utah, February 22, 2013. 40-Hour Negotiation and Mediation Intensive Workshop (eight hour communication theory and skills segment), Institute of Advanced Mediation & Problem Solving, Salt Lake City, Utah, January 15, 2013. 1Overcoming Impasse: Tools for the Toolbox, Utah Dispute Resolution (UDR), Salt Lake City, Utah, December 10, 2012. Conflict Management through System Design, Utah Council on Conflict Resolution, Salt Lake City, Utah, October 24, 2012. Unearthing Buried Conflict, Utah Council on Conflict Resolution, Salt Lake City, Utah, September 26, 2012. Handling ‘Rambo’ Litigators in Utah: Ethics and Professionalism, National Business Institute (NBI), Salt Lake City, Utah, August 17, 2012. Real World Conflict Resolution and Communication Effectiveness: Pitfalls on Dealing Poorly, Utah State Bar Dispute Resolution Section and UCCR, Salt Lake City, Utah, June 26, 2012. Escalation in Conflict: Contentious Tactics Employed in Mediation, UCCR 14th Annual Symposium, Utah Council on Conflict Resolution, Salt Lake City, Utah, May 18, 2012. Uncivil Negotiations: How Contentious Tactics Harm the Legal Practice, Idaho 4th District Bar Association, Boise, Idaho, November 23, 2011. Judicial Perspective on Encouraging Settlement, panel moderator (including Hon. Royal Hansen, Hon. Robert Hilder, and Hon. Deno Himonas), ADR Academy, Utah State Bar Dispute Resolution Section, October 13, 2011. Real World Conflict Resolution and Communication Effectiveness: Enlightened Perspectives on Ethics, Cultural Issues and the Pitfalls of Dealing Poorly, Utah State Bar Dispute Resolution Section and UCCR, Salt Lake City, Utah, June 28, 2011. Why Are Lawyers Such Lousy Negotiators?, Utah State Bar Spring Convention, St. George, Utah, March 19, 2011. Faculty, “ADR Academy” Dispute Resolution Section, Utah State Bar, 2009 – 2014. Identifying “Rambo” Litigators: Appropriately Dealing with Legal Incivility, National Business Institute (NBI), (Dirty Litigation Tactics: How to Deal with the “Rambo” Litigator), Seminar Article, April 15, 2015. Hidden Agendas: Why “Rambo” Litigators Exist, National Business Institute (NBI), (Dirty Litigation Tactics: How to Deal with the “Rambo” Litigator), Seminar Article, April 15, 2015. Don’t Lose the Trial Before It Begins: Evaluate Your Case, Kansas Defense Journal (Fall 2014), available at http://kadc.org/Portals/0/Content_Newsletter/2014%20Fall.pdf. The Dispute Resolution Section: Celebrating 15 Years, 27 Utah Bar J. 35, Nov/Dec 2014. Why are so Many Attorneys Bad at Mediation? And How Can the Mediator Help?, Utah State Bar Dispute Resolution Section, October 20, 2014, available at http://disputeresolution.utahbar.org/assets/KelsonMediation.pdf. Effectively Representing Clients in Mediation with Civility and Professionalism, 2014 ADR Academy, Utah State Bar Association, Seminar Article, October 10, 2014. Don’t Lose the Trial Before It Begins: Evaluate Your Case, DRI (The Voice of the Defense): 20 Trials and Tribulations 2 (Spring 2014). Hidden Dangers of Practice: Violence Against the Legal Profession, Utah State Bar 2013 Fall Forum (Violence and Threats Against the Utah Legal Profession: What is Occurring and How to Respond), Seminar Article, November 15, 2013. Ethics and Professionalism: The Damage of Legal Incivility, National Business Institute (NBI), (Dirty Litigation Tactics: How to Deal with the “Rambo” Litigator), Seminar Article, May 23, 2013. Where Many Litigators Still Fear to Tread: Adapting to Mediation, 25 Utah Bar J. 6, Nov/Dec 2012. Violence Against the Nevada Legal Profession: Results of the 2012 Survey, State Bar of Nevada, available at http://nvbar.org/articles/content/online-exclusive-violence-survey-report. Ethics and Professionalism: The Damage of Legal Incivility, National Business Institute (“NBI”) (Handling “Rambo” Litigators in Utah), Seminar Article, August 17, 2012. Escalation of Conflict: Understanding and Addressing Contentious Tactics in Mediation, UCCR 14th Annual Symposium, May 17th and 18th, 2012. Small Claims Mediation: Thoughts for Practitioners, 22 Utah Bar J. 31 May/June 2009. Ellis v. Estate of Ellis: The Unequivocal Death of Interspousal Immunity in Utah, 21 Utah Bar J. 2, Mar/Apr 2008. Fighting for the Moral Highground: Civil Misconduct Within the Legal Profession, DRI (The Voice of the Defense): Lawyers’ Professionalism and Ethics 2007 Spring Newsletter. Violence Against the Utah Legal Profession – a Statewide Survey, 19 Utah Bar J. 8, July/Aug 2006. “Going Judicial”: Violence Against the Legal Profession and Preventive Strategies, Mun. Law, July/August 2005. Judicial Independence and the Blame Game, 15 Utah Bar J., Jan / Feb 2002. Violence Against Lawyers: The Increasingly Attacked Profession, 10 B.U. Pub. Int. L.J. 260, 2001. The Doctrine of Interspousal Immunity: Does it Still Exist in Utah?, 3 J.L. & Fam. Stud. 2, 2001. An Increasingly Violent Profession, 14 Utah Bar J. 13, Mar. 2001. The Doctrine of Interspousal Immunity in Utah: Does it Still Exist?, 13 Utah Bar J. 21, Dec. 2000. Violence Against Lawyers, 23 J. Legal Pro. 197, 1998 / 1999.